2) Sintering or co-firing demanding uniform controlled atmosphere and temperature processing. Gas fired kilns, equipped with high velocity recirculating burners utilize excess air at low temperatures and on-ratio operation at high temperatures to affect atmosphere and temperature uniformity within ± 2°C up to 1800°C. 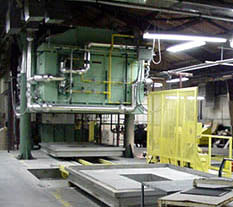 Electric fired kilns, such as the top hat unit shown, are equipped with zone controlled heating elements and atmosphere recirculating inspiration jets (up to 1,000 fps), to achieve temperature uniformity of ± 2°C up to 1800°C. 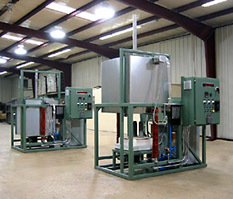 These jets add high velocity convection heat transfer to the electric infrared heating in the kiln. For example, the actual measured temperature uniformity values of a kiln firing to a setpoint of 1260°C are shown in the table below.